Parks, who was in eighth grade at Keefe Avenue School, wrote the essay in 2016, when she was in sixth grade. The essay won third place in the contest. 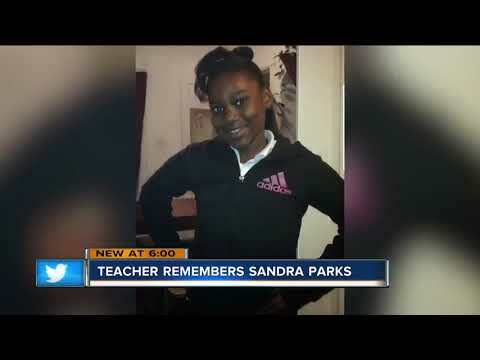 13 year old Sandra Parks who wrote an award-winning essay about the constant shootings in her hometown of Milwaukee and elsewhere, and the emotional toll they have on young people like her. "Little children are victims of senseless gun violence," she wrote. " ... I sit back and I have to escape from what I see and hear every day. When I do; I come to the same conclusion ... we are in a state of chaos." Two years after she won an award for her essay, bullets shattered Sandra's bedroom window as she watched television Monday night. The stray bullet fired from outside her home hit the 13-year-old, killing her, CNN affiliate WISN reported. Milwaukee Mayor Tom Barrett described "the insanity" of gun violence in the city and nationwide. "Sandra Parks ... went into her bedroom. She never came out alive," Barrett said at a news conference. "Tragically, her death was caused by someone who just decided they were going to shoot bullets into her house and she's dead." Prosecutors charged two men in the shooting death Wednesday, including one who was found hiding in a closet after the incident, the affiliate reported. It's unclear if the home was targeted.